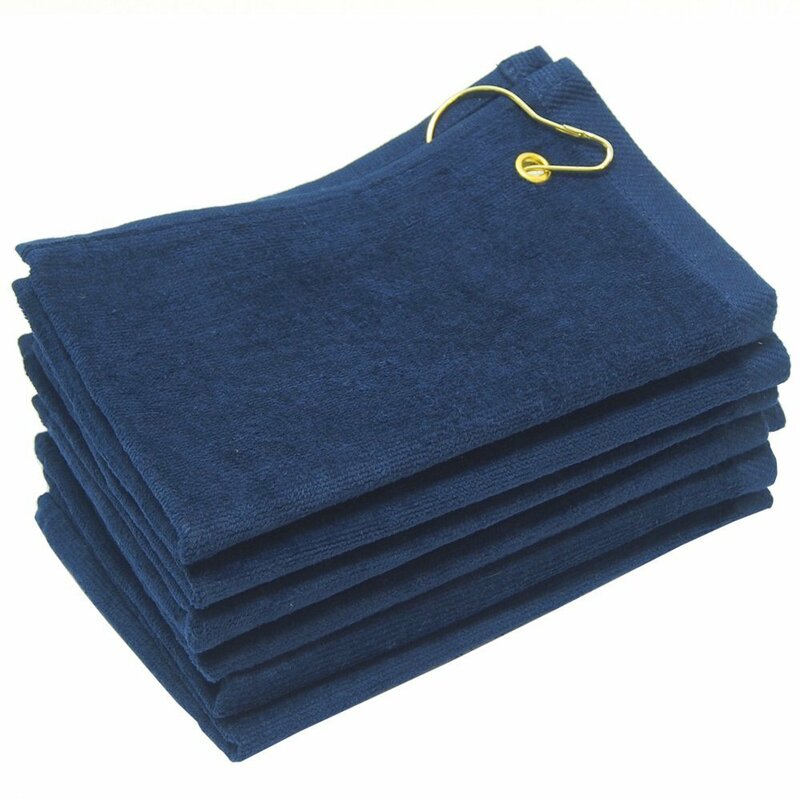 100% cotton high quality terry velour golf towels in navy blue. These towels have a corner grommet ideal for use in golf courses, easy to hang. Golf towels are a necessity for every duffer, but not all towels are built alike. At Towel Super Center, we believe that premium quality doesn’t have to cost a fortune. That’s why we offer these navy blue corner grommet golf towels at unbelievably low prices. The more units of one dozen golf towels you buy, the less money you’ll spend on every towel. Buy the golf towels you need today, and have them delivered to you right away. Get more wear out of your golf towel, and stop wasting money on golf towels that don’t hold up. Enjoy a golf towel that will dry quickly, making it ready for your use sooner. Invest in a golf towel that’s easy to clean and looks great after multiple uses. Place your order with Towel Super Center today! Golf Fundraiser? Give Navy Blue Corner Grommet Golf Towels! Are you looking for the perfect giveaway item for your upcoming golf fundraiser? Navy blue terry velour golf towels are the ideal fit! They’re a one-size-fits-all solution that’s attractive, economical and practical. Every time the golfers who come to your fundraiser hit the greens, they’ll have a reminder of your organizational mission. Does Your Business Need Wholesale Golf Towels? Hotels: Do you regularly get vacationers who come to your hotel for the sole purpose of spending as much time on the links as possible? Give those guests a courtesy terry velour golf towel when they check in. Be sure to add your logo to these soft, durable golf towels with handy grommet. Sports suppliers: Does your retail establishment sell golf clubs, bags, apparel and more? Consider giving a free golf towel with a grommet to everyone who makes a purchase totaling a certain amount. It's a nice way for you to extend your marketing and give buyers a little more than they expect. Cruise ships: Will your cruise take your guests to a golfing paradise? Arm them with these navy golf towels so that they can not only be ready for the greens but also remember your thoughtfulness. Grommets make sure golfers don’t lose their golf towels when they need them most. With the grommet and hook in the corner, these towels are ready for a round! Wondering if these plush terry velour golf towels hold up under normal wear and tear? You'll be delighted when you discover that they clean up easily for long-time use. Be sure to toss these navy golf towels in the laundry after every day out on the links for best results. They'll come out of the dryer ready to tackle three, nine or 18 holes!